Media guru and Emmy Award-winning correspondent Bill McGowan-coach to some of the biggest names in business and entertainment, including Eli Manning, Kelly Clarkson, Jack Welch, Thomas Keller and Kenneth Cole teaches you how to get your message across and get what you want with pitch perfect communication. He is also a trusted advisor in the C-suites of tech companies like, Facebook, Spotify, AirBnB, Dropbox and Salesforce.com. Saying the right thing the right way can make the difference between sealing the deal or losing the account, getting a promotion, or getting a pink slip. It's essential to be pitch perfect-to get the right message across to the right person at the right time. 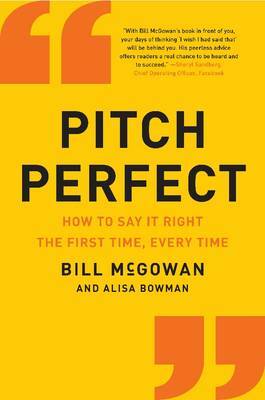 In Pitch Perfect, Bill McGowan shows you how to craft the right message and deliver it using the right language-both verbal and nonverbal.